During the reception for Axis Gallery’s 10th National Juried Exhibition, I had several artists ask for advice about the best way to pack and ship to a juried show. I do not know what is the “best” way but I do know what has been successful for me. One of the things to keep in mind when shipping to a show, it is more then likely the work will need to repacked and shipped back to you. Bubble wrap is fine for a one way shipment but for work that needs to be returned it can be a problem. The bubble wrap is often damaged when the work is unpacked and you can’t assume the the person repacking the work will rewrap the work with the same care you used. This is why a packing system that is setup for the work to be simply placed in the carton is best. First the carton. As an artist I will assume that you are like me and want to get your work out in the world and shipping to shows will not be a one time event. 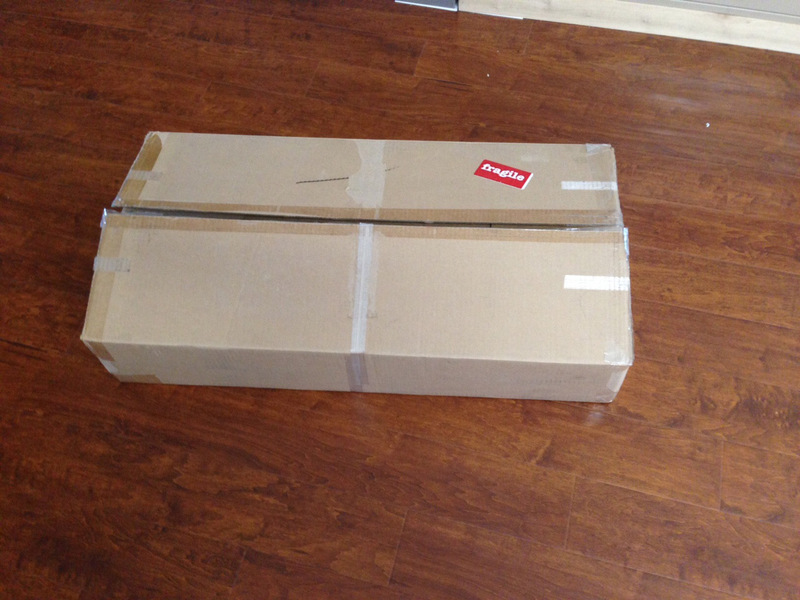 Finding an appropriately sized box at a store that sells boxes is near impossible and very expensive. The resource I use is uline.com. You can buy a bundle of 15 to 20 boxes for about what you would pay for 3 or 4 boxes at a retail store and the size selection is phenomenal. After making the box selection you need to prepare it to protect and cushion the work. The first line of protection is the box itself but this does not offer enough protection for dreaded puncture damage. 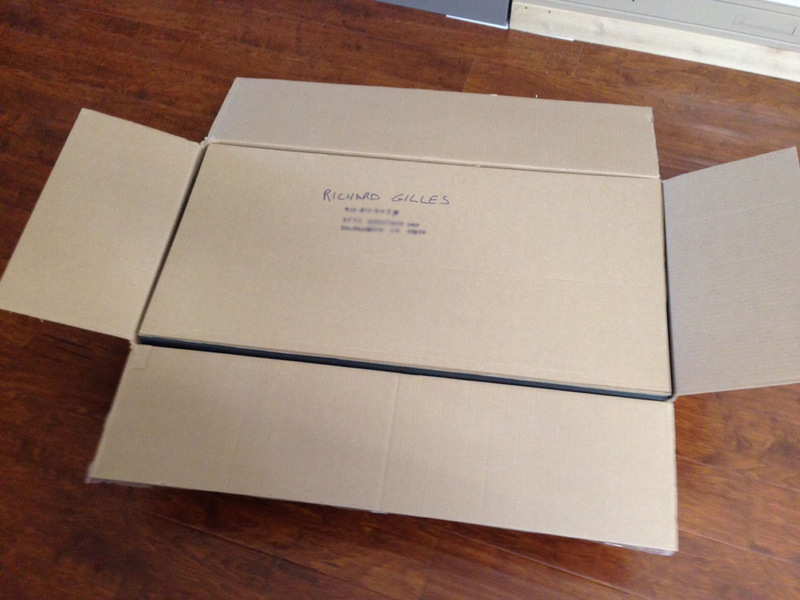 For this I create two additional pieces that fit in both the top and bottom of the box. I make them out of a heavy chipboard, some times doubling it up. This strengthens the weakest part of the box, the seam, makes the box more rigid, and helps protect the work from punctures. Next is the cushion to protect the work from impact and vibration. For this I essentially make a interior box out of foam rubber that the work will fit snugly into. In the past I have been able to get foam rubber sheets from upholstery suppliers, this can be pricey, or repurpose found foam. For this post I set out to find a lower cost supplier. 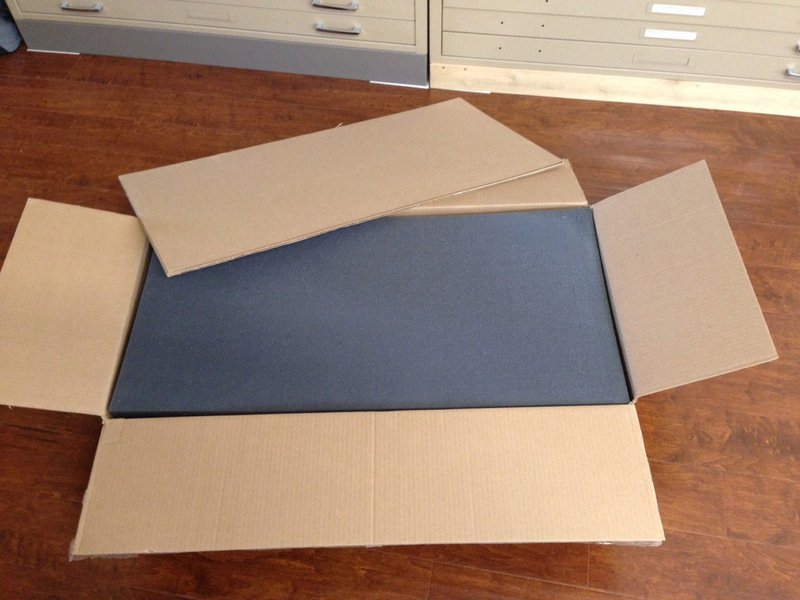 I have just ordered a 1″x72″x40″ charcoal gray sheet from www.foambymail.com for only $15.99. I expected to get really soaked on the shipping because of the size but they have a flat shipping rate of $12.99 for orders up to $75, and free shipping over $75. I will post an update when the foam arrives next week. 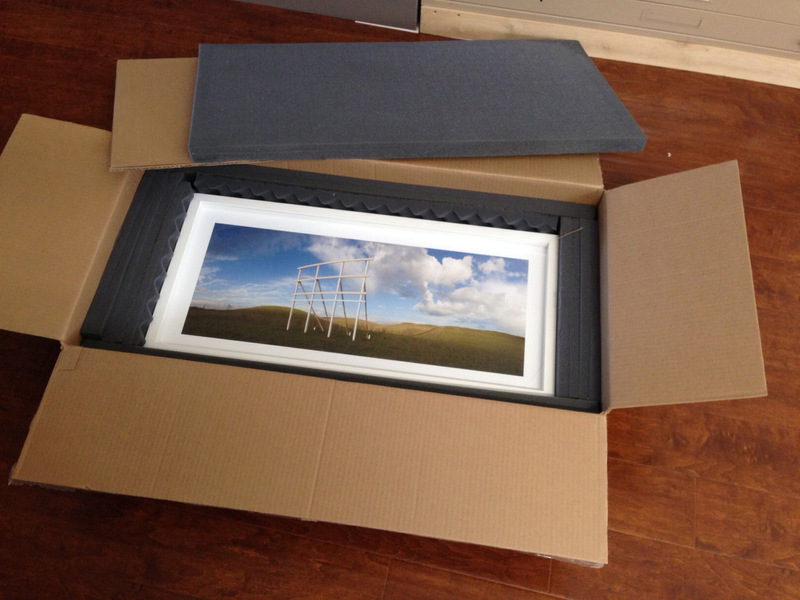 I usually ship framed photographs protected by plexiglas, but if you are shipping a painting you will need to place it in a plastic bag or wrap it in glassine so it does not come in direct contact with the foam rubber. For shipping the work it is best to create an account with either UPS of FedEx and process your shipment online. When you print out the shipping label you can also print a return label. This answers another question I recently received. What if the work is sold, are you out the cost of the return shipping? No, if you process and print your return label online you are not charged for it until it is back in the system on its return trip. (note: this does not apply to USPS). The other reason for processing your own shipment is that it is cheaper. If you ask, my preference is FedEx. Always, always have your name, address and phone number inside the box. I put it on the top chipboard so it is the first thing seen when the box is opened. 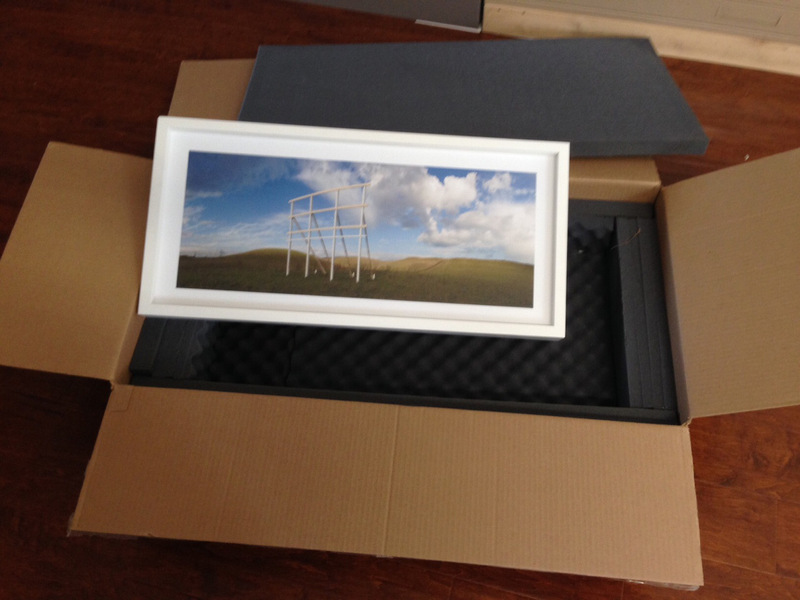 So congratulations you are in a show, you’ve shipped your work out, unfortunately it did not sell and the work was returned with the box a little beat up. Because you bought a bundle of boxes, you put together a new box, transfer all the chipboard and foam into it and “Bob’s your uncle” your ready to ship again to the next show. As you can see this is my all new website. It includes, of course, galleries for work, but also has a link on each gallery page for the artist statement and other information about the series work. One of the new features is a News page that actually works. I hope to be keeping up with posts of all news. I am launching the web site with my most current work. This is the web debut of my California Valley series that recently showed in May at Axis Gallery. The Signs of the Times and Towers series are also included in the initial launch. In the next few weeks I will be going back in time to add more work from the past. Next up will be The Highway Remembers and Almost Home-Less series. Eventually I will be adding some of my older analog work. 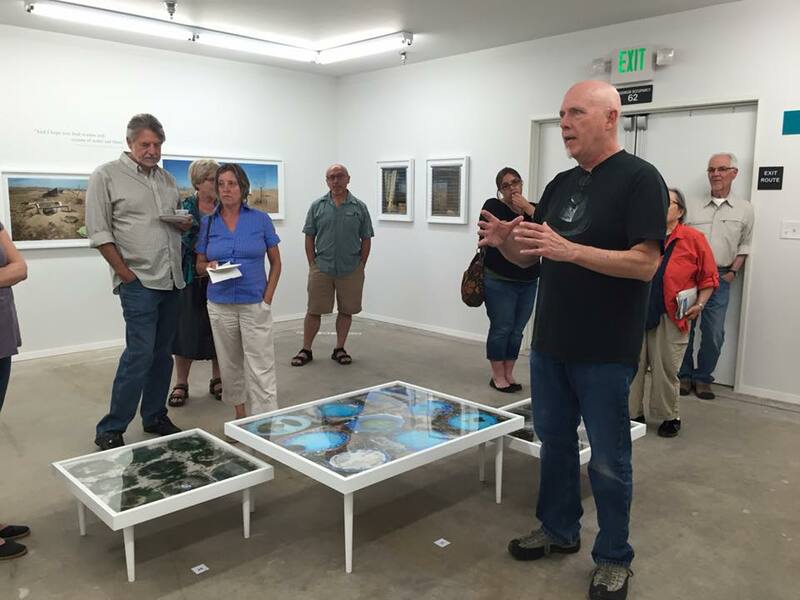 A big thanks to all that came to my talk and supported me and my show. 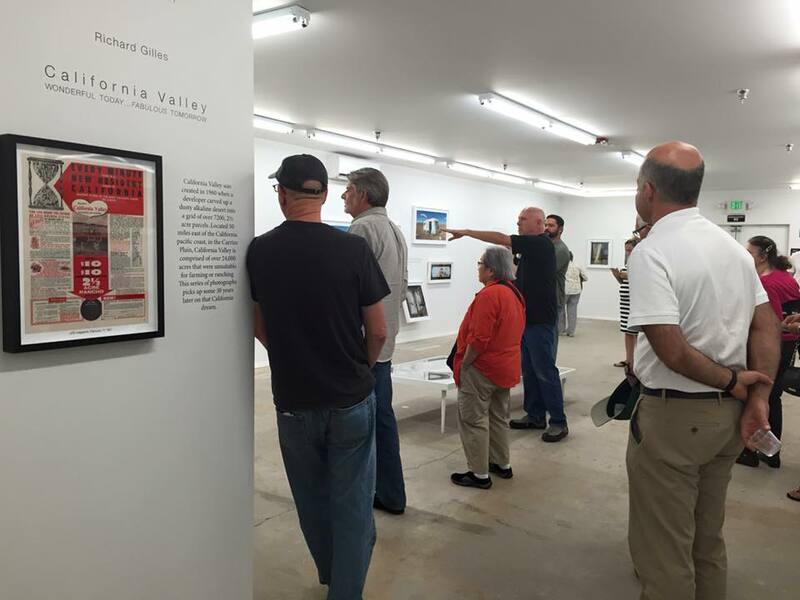 California Valley – Wonderful Today…Fabulous Tomorrow is installed and opens tomorrow, April 30th and will be up until May 31st. The title is a direct quote form a c1963 brochure printed by the developer to sell the 7200 parcels in the development.